Among a host of amazing things, maybe the most amazing thing about Black Panther is that it’s a superhero movie. 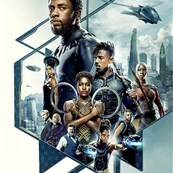 For all the weight and expectation and political pressure and representative issues that come with being the first black superhero movie released by Marvel Studios—and the first black superhero movie released during this current golden age of superhero movies—Black Panther is, at the end of the day, just a superhero movie. It’s a really good superhero movie—great, even—and it rises on the strength of its storytelling, which is what makes it amazing. Black Panther shows what can happen when a new perspective is used to examine familiar stories, when a new voice is invited to participate in the conversation. Suddenly, the story feels fresh and different. Suddenly, the myth takes on a novel form. Suddenly, the world gets that much bigger. 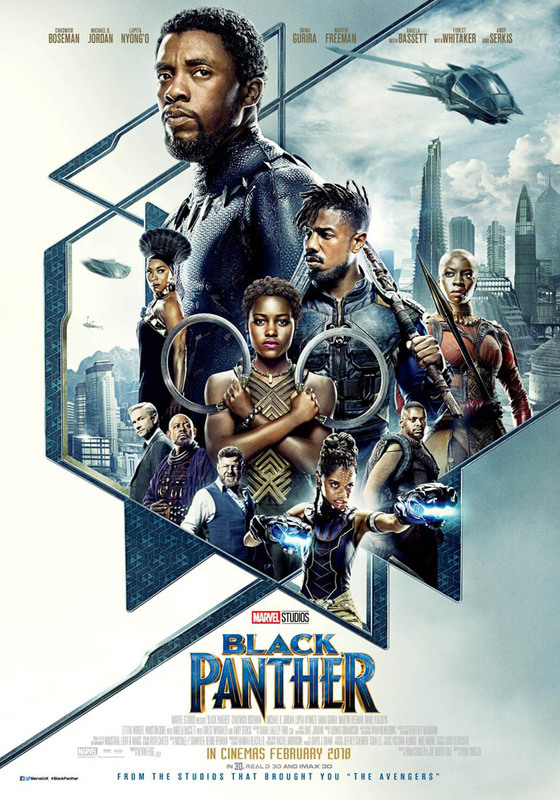 The world, at least the world of the Marvel Cinematic Universe, has grown to encompass Wakanda, the African nation ruled by T’Challa (Chadwick Boseman, oozing gravitas), who must return home to claim his place as king following his father T’Chaka’s death. To the outside world, Wakanda is a third-world country of poor farmers, isolated by mountains and an “impenetrable rainforest”. But in reality Wakanda is a technological marvel, protecting itself from outside threat by perpetuating that third-world myth. But as T’Challa’s jet takes him home, an invisible barrier is breached and the real Wakanda is revealed—an Afro-futurist paradise, a gleaming, wondrous nation. Wakanda is beautiful, exciting, different, a techno-marvel that incorporates elements of traditional African architecture and culture (shout out to Ruth Carter’s costumes and Hannah Beachler’s production design). It is an almost painful imagining of what a world without violent colonization could be, where past and future co-exist, one honoring the other, the old ways preserved as new advances emerge, culture intact even as it evolves. Black Panther is steeped in blackness, celebrates it, revels in it, LUXURIATES IN BLACKNESS. It is unapologetically black, from the streets of Oakland in the 1990s to a British museum displaying artifacts looted from a plundered continent, to Wakanda, where African culture is celebrated with an unabashed, infectious joy. You cannot separate black identity from Black Panther, but from the specific comes the universal, because Black Panther is a story about a family and a damning secret. The plot builds off a mistake made by King T’Chaka (portrayed by the father-son duo of John Kani and Atandwa Kani) when he was a younger man, a wrong choice turned into shameful secret. T’Challa is left to wrestle with the consequences, and who can’t relate to a child coming to terms with the failures of a parent? (Black Panther is having a nice conversation with Thor: Ragnarok about legacy.) Fathers and sons, brothers and sisters, heroes and villains—the revelation of Black Panther is simply that these are the stories that unite us. About that villain. Erik Killmonger (Michael B. Jordan, full swagger) is a very good villain because like all the best villains, he’s not overcomplicated, with a clear, articulate motivation and even a sympathetic cause. Killmonger is the cracked-mirror reflection of T’Challa, attempting to turn the mechanisms of oppression against the oppressor, without quite seeing how he’s become just like the oppressor himself. He’s a tragic figure, destroyed by the systemic oppression of the colonized world outside Wakanda. He is our real world in sharp relief against the possibility of Wakanda, and it is a damning juxtaposition. But the tragedy of Killmonger exists amidst the celebration of Wakanda, where T’Challa may be king, but women rule. The women of Black Panther are SPECTACULAR. The Dora Milaje are everything promised by the line “Move, or you will be moved.” Their general, Okoye (Danai Gurira), is breathtakingly badass (we shall live our lives so as not to disappoint Okoye). Wakandan spy Nakia (Lupita Nyong’o) has you like, Black Widow who? And Queen Ramonda (Angela Basset) is equal parts regal queen mother and protective mama panther. But the standout is, as promised, Shuri (Letitia Wright, utterly delightful), T’Challa’s sister. She’s a big science brain wrapped in a provoking little-sister package, and every second she’s on screen is sheer joy. Shuri lights up the whole film, and while Black Panther is a contained story that has sh*t-all else to do with the rest of the MCU, the idea of Shuri showing up Tony Stark in Avengers: Infinity War is delightful to contemplate. Black Panther is something we think we know told to us in a new way. It’s revolutionary by virtue of being different, for introducing a new voice into the room. Ryan Coogler made a great superhero movie, full of indelible characters and stunning visuals. (My only complaint is that some of the action scenes feel perfunctory, and it’s clear ticking boxes on the action checklist is not what Coogler is here for, which is fine. Marvel has a stable of stone cold second-unit pros who can make that sh*t look good while Coogler builds Wakanda.) Coogler and his team recognized their moment and ran headlong into it, and the result is a boisterous celebration of black culture and a damn good yarn about a hero and a villain and the one mistake that divides them. We’ve waited for Black Panther for a long time, and it delivers on Every. Single. Level. Wakanda Forever!